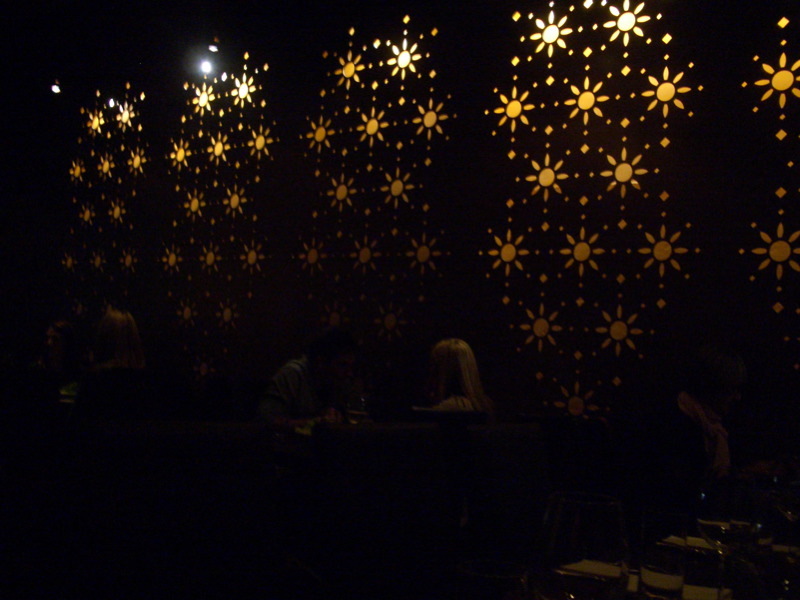 The appearance of favourable reviews of Mama Ganoush (complete with beguiling photographs of dreamy starry interiors) on Stickyfingers' and Ed's blogs late last year ensured I tucked the Windsor restaurant into a corner of my brain, ready to suggest it as a venue to try next time I found myself southside. 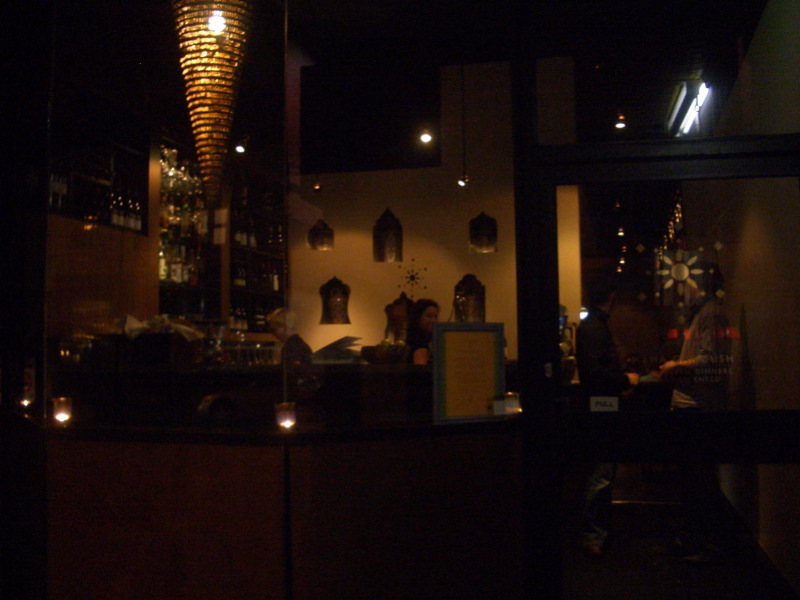 It may have taken a while but lo and behold, best-friend-K and I were going to a 30th at the function room at the Rails just across the road, so dinner at Mama Ganoush it was! According to the Epicure review, the restaurant is housed in a former shoe shop (the Epicure review goes on to quip: "With a thorough and stylish makeover elevating the place well beyond its Elsternwick sibling [Arabesque] in the glamour stakes, Mama looks and feels more Blahnik than Bata" - am I the only one who threw up a little reading that last phrase? What is this, the freaking Sunday Life magazine?! Did Lethlean really write that, or is it the unfortunate result of some lame copy editor trying to add a touch of "journalistic bling"? Ughh). 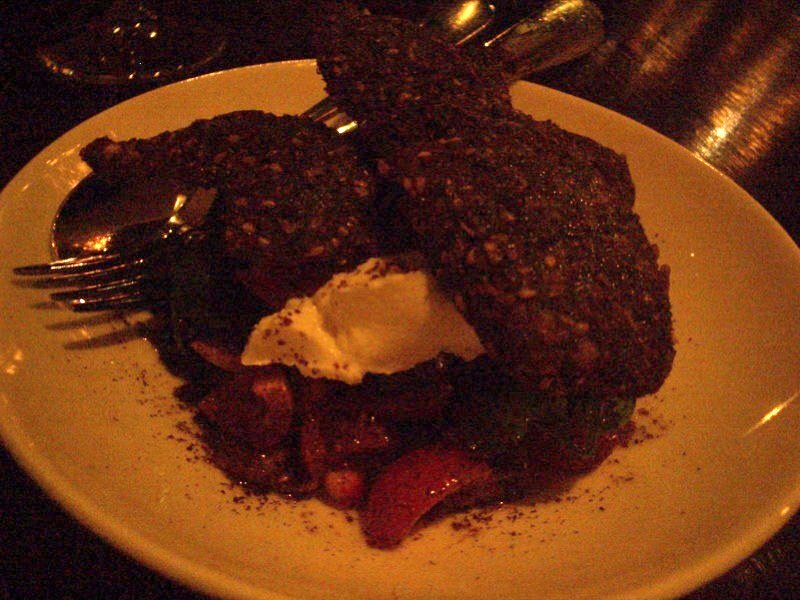 Quail with za'atar crumbs, eggplant fattouche and goat curd ($17.50). I've freely admitted in the past that I don't know much about Middle Eastern cuisine, so I had to do a little googlestalking to learn that za'atar is a mixture of spices used as a condiment, and fattouche is a salad characterised by small pieces of toasted or fried pita bread. 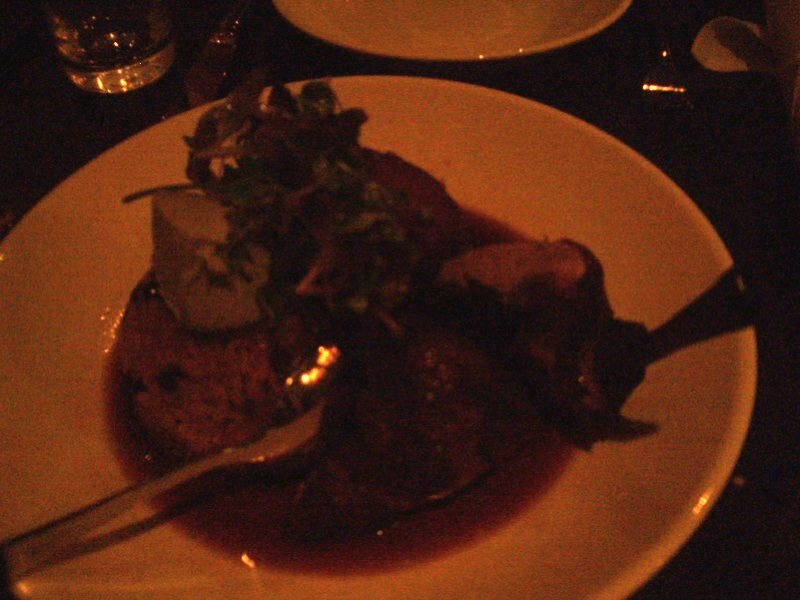 The quail was juicy and tender, and the salad was tangy and studded with pomegranate seeds, so I was happy as a sandboy. The other small dish we shared was the Aleppo style 'wagyu' beef tartare with salsa harra, fresh mint and jou-jou bread ($21). I've been reading up on Aleppo, a Syrian city which was awarded the 2005 Grand Prix of Cultural Gastronomy by the Académie Internationale de la Gastronomie in Paris - read a snappy article about Aleppo by Melbourne-Lebanese legend Greg Malouf (his brother Geoff is an owner of Mama Ganoush) here. This dish wasn't quite what we were expecting: the construct-your-own meat, spicy salsa, fresh lettuce and mint on soft round bread topped with a pickled chilli felt a little like a posh Middle Eastern version of fajitas! That said, we really enjoyed it. 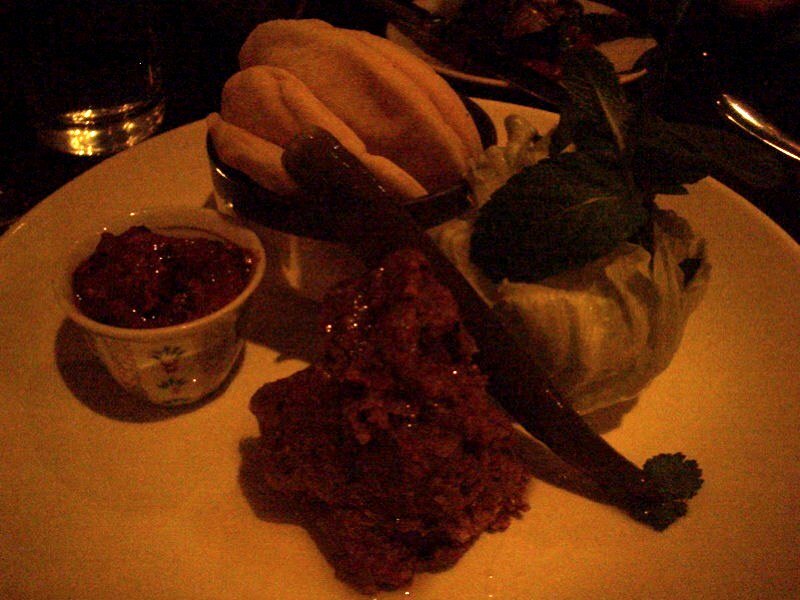 We got one main to share: Middle Eastern spiced fried duck with honey and currant pilav, mint labne ($37), which was similar to the quail (spice-encrusted poultry with gooey deliciousness on the side - I suppose in hindsight we should have chosen something different for more variety) but it too was excellent. Loved the flavour of honey that really came through in the pilav. 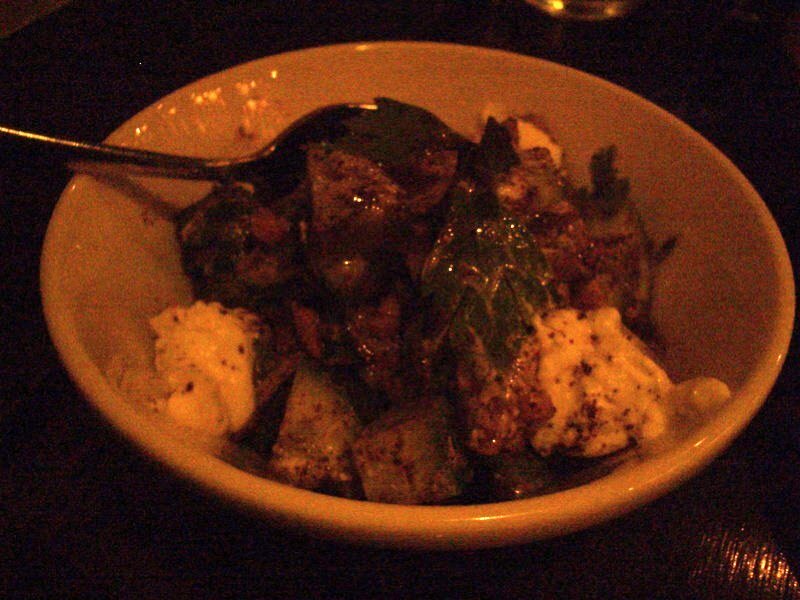 Our side was the cucumber salad with sumac, chevre and pine nuts ($10). Simple, delicious. We felt sated. That is, until we saw the dessert menu and b-f-K talked me into sharing the hazelnut and milk chocolate mousse with chocolate fairy floss, and praline ($13). I'm SO glad she did - the mousse had just the perfect amount of sweetness and richness. It turned out to be the second time that day that I'd had Persian fairy floss (I'd made JP cupcakes just that afternoon) - think I prefer the chocolate to the pistachio. 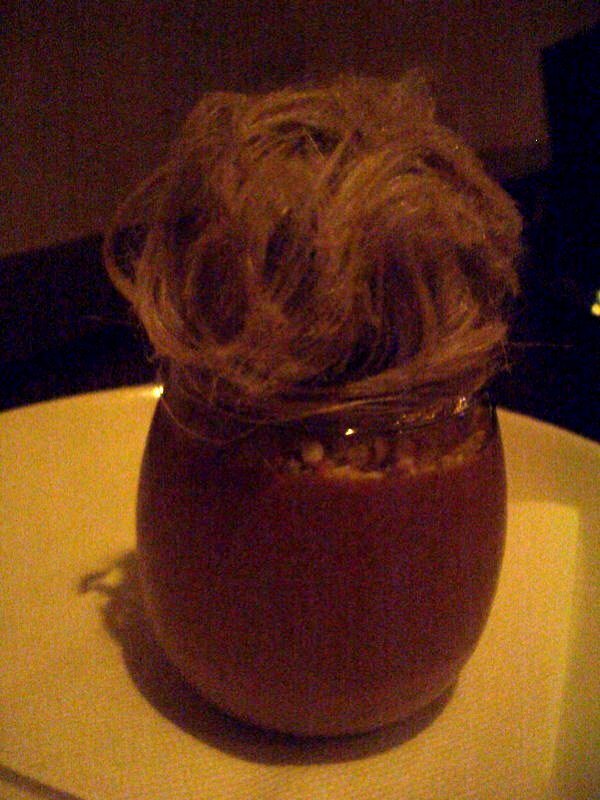 And how cute is this dessert - it looks like a little toy head with a greying wig! Do you remember if there were many vegetarian options on the menu? The dishes you had look amazing! Johanna, you should bear it in mind for next time you're southside... but be warned you may need to book a bit in advance for weekends! Cool, thank you for that. It looks verrrrry interesting. I love Middle Eastern food. Right. Going to book in for an upcoming b'day, darls. The veg options sound incredible. That winter tabbouleh ha my name written all over it. 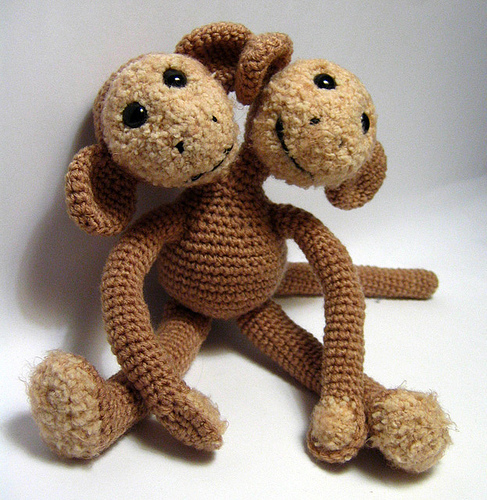 Can I just say it was lovely to meet you 'tother day? Let me know once you've been to Mama!